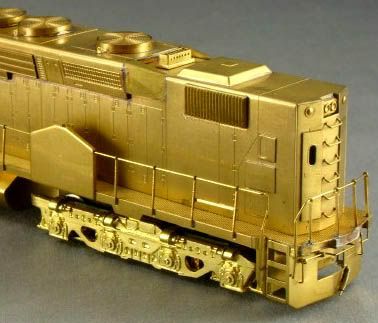 Union Pacific's Centennial arrived in HO scale first in brass from ALCO Models in 1976. The retail price was $225 for this giant model that measured over 13-inches in length. The Centennial was built by KMT in Japan for ALCO Models. The model was reviewed in the November 1976 issue of RAILROAD MODELER magazine. The magazine's review stated the model utilizes a pair of Pittman-type motors and maximum scale speed was measured to be 60 mph. For prototype accuracy, the review notes ALCO Models provided air reservoirs are separate items included, but not attached to the model. This featured allowed for creation of different examples of the DD40X, as per prototype. Owned exclusively by Union Pacific, EMD's DDA40X was built between 1969 and 1971 with 47 examples produced. The double diesel produced 6,600 horsepower and know as the Centennial. The DDA40X is the most powerful and longest diesel locomotive produced. 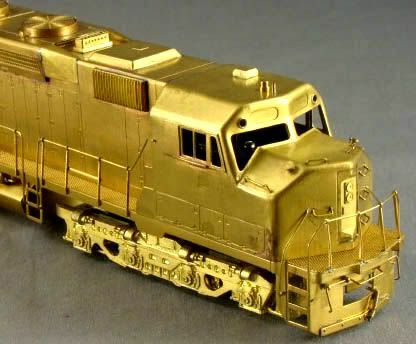 The first plastic model of EMD's DD40X arrives in 1980 from Bachmann in HO-scale. Bachmann would later enhance the model and offer it in the company's Spectrum line. More recently, Bachmann has installed a DCC decoder and presented the DD40X in their DCC on Board series of releases. Athearn's Genesis series of high end HO-scale releases introduced a DD40X to the line in 2012. The Genesis DD40X features numerous separately applied parts and state of the art tooling. Athearn presents the model in standard DC and DCC Tsunami Sound equipped examples.